NHL 95 is a fast paced sports title based on a fast paced sport. But for someone who knows nothing about Ice Hockey is it even worth a glance? I've had an epiphany. Maybe the reason I didn't like sports at school was because I wasn't presented the opportunity to do one I'd enjoy. Cricket confused me. Rugby scared me. Football made me feel alienated. However at Christmas each year I enjoy a quick circle around a skating rink. Admittedly I spend most of the time clinging onto the barrier at the side but it's enjoyable despite this. I identify a lot with the comic book character Scott Pilgrim and he was a huge ice hockey fan. I used to ski once a week so maybe if I had access to ice hockey I might have been sporty after all. There's something appealing about it, and not just because the protective padding make the players look like robots. It's fast, there are lots of goals and there's even comical organ music. Yes, maybe if I give Ice Hockey a go I'll really enjoy it. Naturally I don't mean physically. It's much easier to just sit in front of the TV and play a digital game of Ice Hockey and when it comes to 16bit versions of the sport there's evidently only one franchise you should consider; Electronic Arts' 'NHL' games. Perhaps thinking that most people who play video games are those who get picked last in PE lessons, reviewers would often call sports titles "a game that's perfect for those who don't even like sport". 'NBA Jam', 'Sensible Soccer' and even 'Speed Ball 2' were all described this way. In the case of the 'NFL' games, having no understanding of the sport clearly is not a concern given the lead developer of the series' most critically acclaimed iteration was clueless. Mark Lesser, had previously worked on EA's Madden 'NFL' series but by his own admission he wasn't a fan of the sport. "I’d never watched a hockey game; I didn’t know anything about it,” Lesser once admitted. To catch up the developer went on a "Hockey Crash Course" learning as much as possible as quickly as possible. Electronic Arts Staff in California, who took him to an Anaheim Mighty Ducks game. “I didn’t know what the heck they were talking about. I just smiled a lot,” Lesser said. The light bulb moment came when Lesser met with Shawn Walsh, head coach for the University of Maine’s hockey team. "Walsh was something of a local legend" notes video game historian Blake J. Harris. "Lesser attended practices, studied the playbook and had long conversations with the coach; anything, really, to see the sport through his eyes." Walsh helped Lesser become a hardened Hockey fan, sufficiently versed in the minutiae of the sport. “As usual with me, by the time they found out I didn’t know what I was doing, I did,” Lesser said. Armed with a new found enthusiasm for the sport, Lesser set to Work creating 'NFL '94' with the Sega Mega Drive as the lead platform. More than Twenty years later, EA's NHL franchise remains one of the best-selling sports video games in the world. Yearly updates have made the game more intricate and lifelike, thanks in large part to EA's huge team of developers and designers. However Lesser recalls a much more humble production process with the bulk of 'NFL '94' completed in a barn in Maine. "In those days, there weren't big production teams. There was a sole programmer, me, and a graphics guy who I hired," claims Lesser. Lesser's 'NFL '94' was actually the fourth hockey game that Electronic Arts had produced, and while the game is often heralded as the true birth of computerised Ice Hockey it was actually built on a pre existing frame work. You only need look at the credits to see confirmation; 'NHL '94' was "based on ' NHLPA '93' by Jim Simmons". The game maintained the series' signature vertical camera angle, which offered the player distinct gameplay and strategic advantages over contemporary side-view hockey games. In earlier games the player controls the team member closest to the puck, obvious owing to the huge star below their feet. 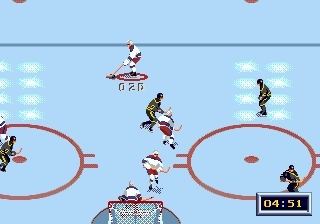 However prior to 'NHL '94' control was limited to the five players on the rink and the goal keeper was entirely computer controlled. Players quickly realised they could secure easy wins over the computer through "Drive by goals" where skating in front of the goalie then shooting across the goal mouth always led to success. Critics leap on this and as a result Electronic Arts wanted the glitch fixed in 'NHL '94'. Lesser was keen to please. "A larger staff of producers told the programmer what they wanted in the game and we would always try to achieve this". According to Blake J. Harris, executive producer Michael Brook knew exactly what needed to be done to 'NHL '94' to improve it. "At the top of Brook’s wish list were shoot-outs, goalie control and one-timers (a type of shot where the player simultaneously receives a pass and shoots the puck in one swift, fluid motion)." Critics certainly appreciated the effort, noticing the updated play mechanics." This is the answer to a hockey fan's dream" Game Players magazine said. "[It has] much quicker goalies and brand new offensive weapons. Icy bliss!" "This is the hockey game you always wanted to play" said Game Pro magazine at the time. "Everything in the NHL is in [this game] everything that is, except the fights, which the league had EA Sports remove". 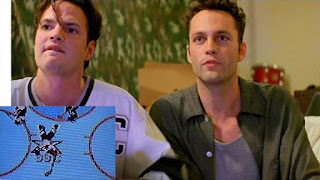 I've always thought it was 'NHL '94' that is played during a legendary scene in the 1996 movie "Swingers". However the film's characters actually played the predecessor, 'NHLPA Hockey '93'. In the film the characters talk about how there used to be fights in the game but developers had taken it out. They believe it was because school children may be emulating it in the playground but the truth was it was down to the American National Hockey League. "Fighting had always been part of the sport – a means for players to police themselves – but it had recently become such a hot-button issue that the league had considered banning it once and for all. The last thing the league wanted was a videogame that glorified fighting” Blake J. Harris recalls. "This was unacceptable, a deal-breaker, and so the NHL demanded that EA remove the feature." As the next game in the series was being duplicated it was too late for Electronic Arts to remove the fighting from their upcoming game. The NHL withdrew the license and true to their word would only allow its use again when the on-rink fights were taken out of the game. Consequently Electronic Arts' were forced to make a simple choice; keep the fights or lose them and regain the authentic team names and logos. While fighting would remain absent from the game for some years, 'NHL '94' was the first hockey title to include entire player rosters as well as all NHL teams. But the attention to authenticity didn't stop there. Executive producer Michael Brook thought there were other ways to improve the realism of this game. For example, it would be easier to emulate stadium ambience by including the proper organ music heard during a match. But, the concern was that each team’s organist played different songs. "That’s not a problem, actually" explained Dieter Ruehle, the organist for the San Jose Sharks, "I can do that." True to his word, Ruehle provided EA with organ music for every team; and he didn’t just provide all of their songs, but also noted which music was blasted during power plays, which tunes were used to celebrate goals, and all the other inside info needed to make each arena feel like home. From the day it was released, 'NHL '94' was a hit; Flux magazine even called it the 8th best video game of all time. 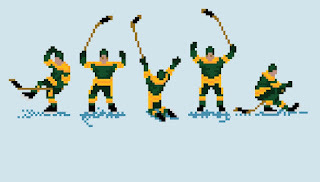 "Fans may have balked when 'NHL '94' ditched the blood and fighting, but in many ways this is the ultimate hockey game from the 16-bit generation" noted Game Informer in a retrospective article. Keeping the license in ‘NFL '94' allowed gamers everywhere to play out their favourite rivalries and changed the way many people viewed both hockey and video games. "'NHL ‘94’ was about that couch experience [that's] where we battled," said Sean Ramjagsingh, lead producer for the many recent games in the NHL franchise. "I was in university at the time, so we used to battle for everything, whether it was cleaning the bathroom or cooking dinner or washing dishes" Ramjagsingh recalls. "'NHL '94' was the decider in who had to do those chores. It's one of the first games that I played religiously [...] 'NHL '94' was the game that put video games on the road map for me and turned it into a career." There is a belief that if something's not broken then you shouldn't fix it. Jim Simmons' 'NHLPA 1993' was "not broken" - it was clearly a good game. Lesser didn't need to "fix it" but his tweaks turned the franchise into something that's adored by many. To use a metaphor from another American sport that I don't quite understand, he "hit a home run right off the bat". Electronic Arts have a reputation for releasing near identical games year on year, but really there wasn't much need to change the foundations set by 'NHL '94'. 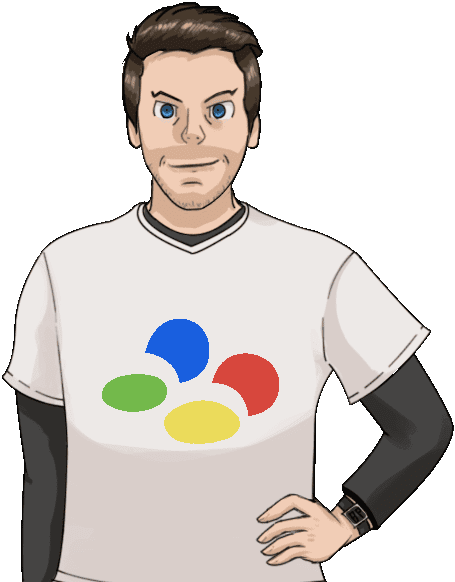 Consequently the Series didn't fundamentally evolve until the introduction of 3D polygon characters. That's not to say the only difference was the year on the box thorough. Each yearly release did add new features. 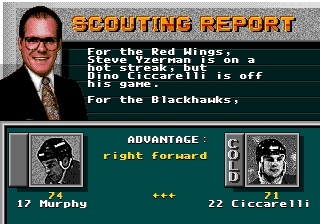 For example, the version I’ve been playing, 'NHL '95', allowed you to play a full season, with light player manager elements also introduced. You could trade, release, and sign players, and the game also introduced the now-standard create-a-player mode. If video games are about living your dreams through an avatar this mode makes that possible. Compared to modern games customisation is incredibly limited but for Ice Hockey fans the chance for them to share a line up with the sport's greats must have been intoxicating. A Destructiod article described this version as "Bliss. Pure bliss [...] 'NHL '95' was truly one of the greatest sports games in the entire lifetime of the Sega Genesis". In fact playing the game on a Sega system is vital, as this is one sport that was consistently inferior on the Super Nintendo. 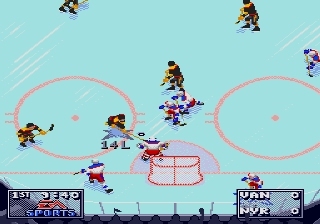 The Sega Mega Drive hardware lent itself really well to hockey games with a faster processor able to handle multiple sprites with simple progressions much better than a Super Nintendo ever could. The only advantage the Snes had for this sort of game was an enlarged colour palette, but provided you could tell the teams apart quickly it wasn’t much of a benefit. Admittedly there does seem to be more weirdly blue ice on screen than team players but sprite size is always a bit of a tricky balancing act when it comes to sports titles. Larger sprites obviously look nicer, but as 'Sensible Soccer' superbly illustrates a more tactical game is possible when players are a dozen pixels high. I didn't get confused playing 'NFL '95' and could easily tell the players apart. But I did think for such as high profile game there were many things that looked a little amateurish. The player profiles are all poorly digitised black and white stills. Crowds are static and a window that shows close ups of action cringe worthy. Presumably it's there to mimic TV coverage but the impressive instantly replays serves a similar function. According to Blake J. Harris, "Lesser genuinely believed that a complete outsider mentality would be one of his greatest assets when reshaping the franchise [but] there was one more advantage, he thought, to approaching something with a naïve point of view: wonderment". Like Lesser, before playing 'NHL '95' my knowledge of the sport was practically nonexistent. As a result when I play the game I have nothing to compare it to. I don't know if the puck movement is authentic, I have no idea if the player and teams are genuine. I get to play the game and judge it as a video game rather than as an adaptation. While there are other sports games I certainly prefer it wasn't a chore to play this, far from it. I was pleasantly surprised by a game that I could get as much from this game as I did. It was Sega Power magazine's turn to call 'NHL '95' "a game to play even if you don't even like the sport". It's a thought I'd echo and it illustrates that while I may not enjoy playing sport in real life, when a controller is involved I become a lot more engaged. It’s stating the obvious but I never would have bought this title were it not in a big bundle of games. I really want interested in it and at one point I even tried to sell it on to my local games shop. They offered me £1 so I thought for that price I may as well hold onto it. I’m glad I did. While it isn’t a game I’ll devote much time to, I can see it getting another spin in the Mega Drive in the future.